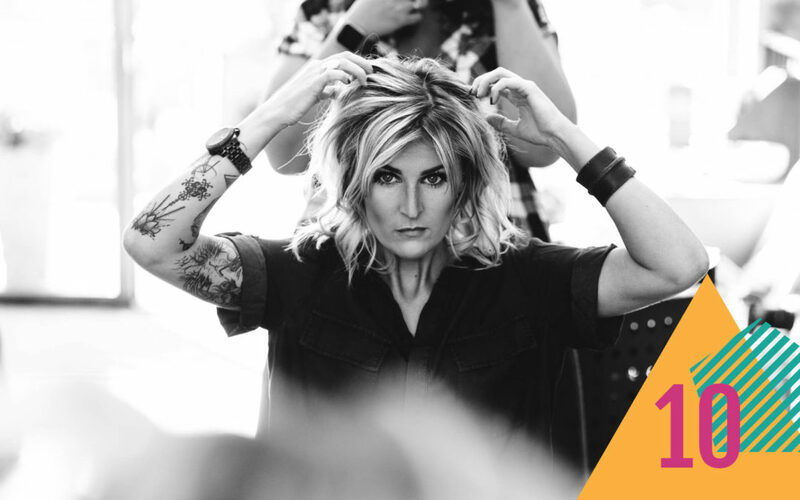 I first met my hair dresser Stacy working at Hannah and Dan‘s wedding back in 2016 and I knew that day that I wanted her to be my hairdresser too. I loved her style and her attitude and how she problem solved when Hannah had forgotten to mention her cathedral length veil until her ‘do’ was nearly finished. With pins and grips made a contraption that stayed in Hannah’s hair all day, despite tricky ins and outs of cars, hugging, the breeze… and all without a sweat. Now she cuts and colours my hair and keeps my fringe (which has a mind of its own) in check and hot topic of convo while I’m in the salon is often wedding hair! 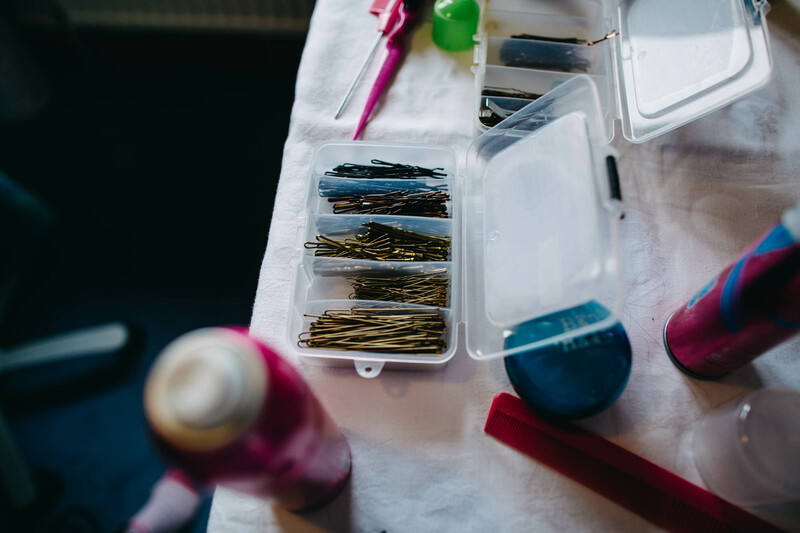 She’s really kindly written some excellent advice about how to plan your wedding hair and finding the right stylist… so without further-a-do, here are Stacy’s top ten bridal hair tips! Choose the dress first (obviously) that’s the most exciting part! Bring photos of you in the dress to your consultation and decide if will you be wearing a tiara, veil or any other type of accessory (veils I have discovered lately have the comb sewn in the wrong way!) So it is always a good idea not to forget that on the day of a hair trial. Create a mood board showing the theme, colour scheme or vibe of your wedding to bring with you too. It sounds bizarre but this helps me in the consultation of knowing the style of hair that would compliment your theme and style of dress as well as including some images of hair styles that appeal to you. Be realistic – understand your hair. Having those thick celeb locks is possible now a days but I advise to consider something more natural to your own hair. Don’t go trying to manipulate your hair into something it simply cant do without the help of a ton of hairspray, it will just end up looking stiff and fake, and you’ll feel really uncomfortable. Listen to a professional’s advice; I usually know what works best for your hair type. Think about your personality. Would you consider yourself to be somewhat conservative and classy, or trendy and daring? Whichever – choose a hairstyle that best suits you, from the hair colour to the tiny extra’s you place or hide in your curls, all of it should at least say something about you. There’s no reason why you should walk down the aisle and not be recognised by your future partner. If you are known for your classy style, then go for an elegant look if you’re a bit out there, and love messy hair go for a tousled wavy look – no need to change, be the best version you. You need to feel comfortable and confident. Location: The one thing that many surprisingly forget to take into consideration is the climate or environment that they’ll be getting married in. Tropical, (if you’re lucky, remember you can take me?) hot or humid, cold/wet/damp maybe even snow – try to think about how your hair reacts in these conditions, you don’t want to be worrying about your hair on your way down the aisle. How will the evening proceed? Some brides have two styles for the day and the evening and why not? 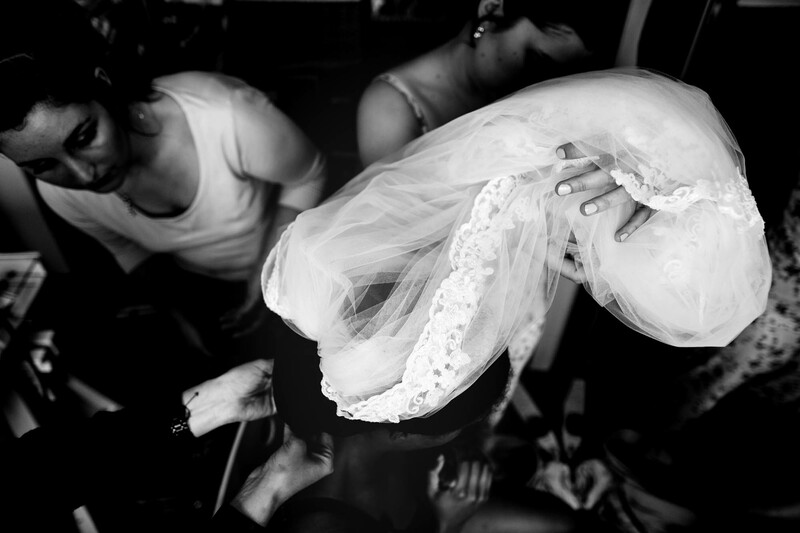 Some have just the one but you need to be prepared to do a touch up after taking the veil out. Try to remember how the evening will play out; with dancing and laughing, maybe some champagne on the side. A smart way to go about removing your veil is starting down and working your way up, if not your hair will make pin marks. With the excitement growing you’ll also want be a little more comfortable. 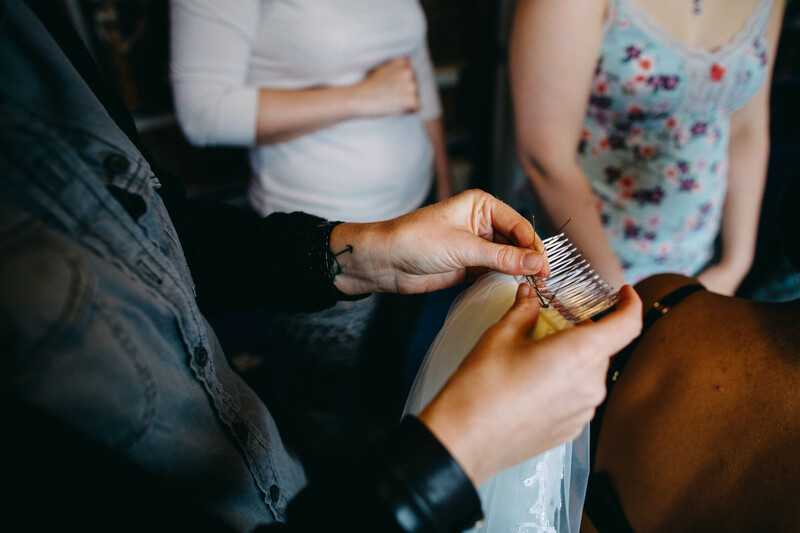 A “quick tip”; I give the bridesmaids (or if you have the awesome Hannah Hall, she sticks them in her bag) some pins and hairspray to tame any unwanted hairs, and show them how to take the veil out neatly! On the day of the trial and the Big Day I personally prefer to work with hair that’s been washed the day before, I find it much easier to work with. Mum might not be the word! The last tip might come across as rude… But! I’ve done this more than once so the input I have might be a valuable one, and on this occasion I will have more knowledge regarding hair than your mum or your mates! 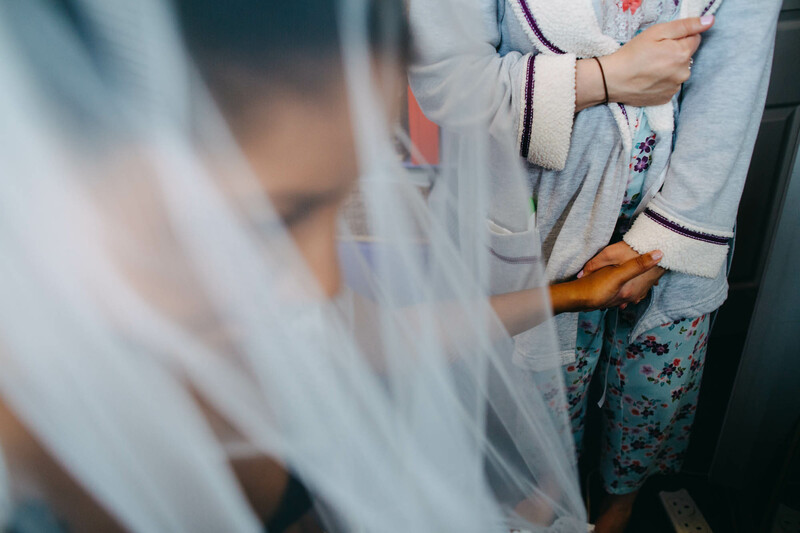 Parents and friends don’t always know what’s best, sorry to put it out there… In some cases I have found, more often than not they interfere with the brides and hairdressers vision, as it is not what suited them personally… Your day, your way! So some final advice to wrap this up… When you’re looking for a wedding hairstylist, look through their portfolio check that they create the styles you’re wanting, ensure to check the reviews and there really isn’t anything better than getting recommendations from another bride, so ask around! I’m so grateful to Stacy for taking time to write some really sound advice! Stacy works in The Rear Barn at Glendon Lodge along side Kolaine’s Beauty Lounge (another highly recommended supplier!). You can find out more about her here. Hair advice sorted but still need a photographer? Get in touch. PRO TIP: Hannah + Stacy are the dream team. Sat in my office looking out the window just thinking if today was my wedding I’d need my hair pulled into the tightest plait ever because frizzzzzzzz.